Primitives can be rotated, translated, scaled and flipped. You can also set the colour and opacity. Its worth noting at this point that Iw2D is context (or state) based (like Open GL). which means that if you modify a parameter within the context, such as a transform or a colour then it will be applied to all rendered primitives until you change the parameter again. So for example, if you set the current colour to red using Iw2DSetColour(0xff0000ff) then all primitives will have a red tint until you change the colour. We will later use these values to centre our sprite on the display because it looks much nicer than being stuck in the top left hand corner. Because we want our sprites to do something a little more interesting than just sitting there in the middle of the screen, we are going to spin them (spinning stuff usually impresses people). In order to do that we need track an angle and change it every game frame. I decided to stick all of the sprite rendering code into a nice easy to use re-usable function so that you just whip off with it and use it. It also keeps my code nice and readable. Here we tell Iw2D to set the “current” transform to use when drawing “anything”. Remember that Iw2D is context based and this transform will be remembered, so if you attempt to draw something else without again changing the transform then it will be drawn in the same position, at the same angle and at the same scale. Note that you can reset the current transform back to normal using Iw2DSetTransformMatrix(CIwMat2D::g_Identity). The identity matrix is the default transformation matrix that has no rotation, no translation and no scaling. This section of code draws our sprite on screen. Note that we offset the sprite up and to the left by half its height and width so that it is positioned using its centre point rather than its top-left hand corner. 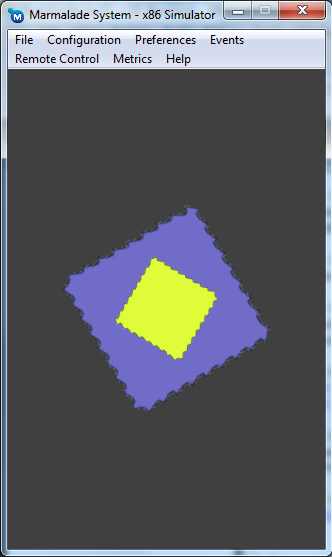 This allows out sprite to be rotated and scaled around its centre. Like anything to do with game development you will eventually come to the point where you need to squeeze every last drop of power out of your rendering engine. Each time you render a different image a new state change is sent to the underlying hardware (this is not efficient by any stretch of the imagination). To help you, Marmalade built an automated batching system into Iw2D so that multiple draw calls using the same image are collected together and batched. Batched is a term used to describe sticking lots of data together and sending it to the hardware in one go. This process is not totally automated however, you will need to draw images by group. For example, lets say you have 10 trees and 5 balls in your scene. The most optimal way would be to draw all of the trees then all of the balls, not 2 trees, 1 ball, 2 trees, 2 balls etc..The astute among you will have noticed a simple problem with batching and that is the problem of draw order. Sometimes it is not practical to draw all trees then all balls because sometimes a ball may appear behind a particular tree. So how do we solve this problem other than using a z-buffer, which I believe is not supported by Iw2D? 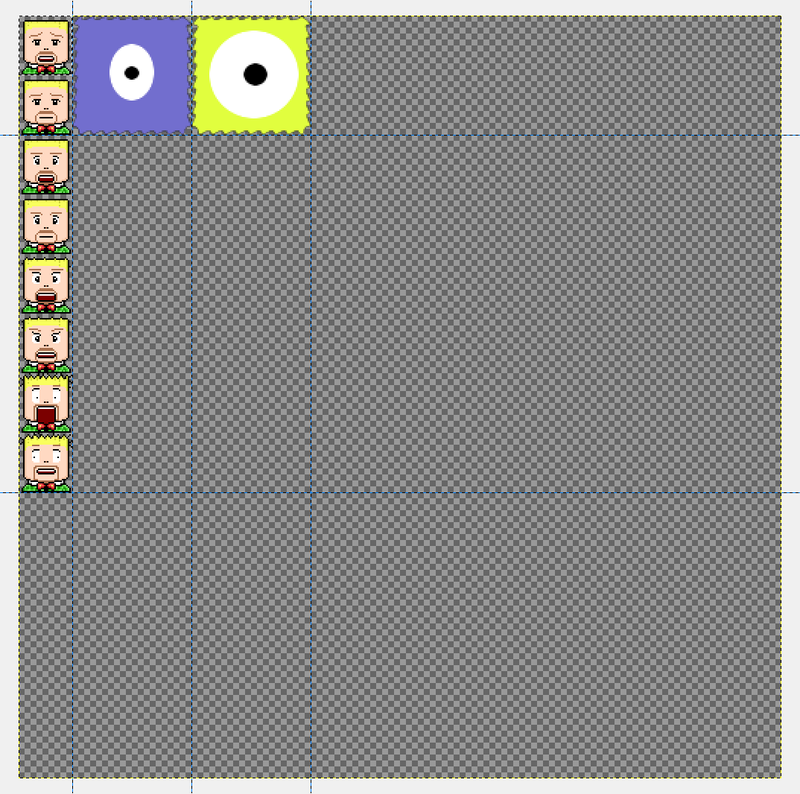 The solution is to arrange the ball and tree image on a single bitmap (usually called a sprite atlas or sprite sheet). When you want to draw the tree, you simply render the portion of the image that represents the tree and when you want to draw a ball, you simply render the portion of the image that represents the ball. This way, you are always rendering the same image (albeit different potions of the image) and never have to worry about batching optimisations. Happy coding and until next time, be careful crossing roads! Ok, so you downloaded and installed the Marmalade SDK, took a quick scan over the help files and thought “Hmm, this is a biggy, where do I start?” When we start something new we all feel like complete and utter noobs. Al you want to do is get a “hello world” application up and running so you can have some kind of sense of achievement and feel comfortable with the process of updating code, compiling it and seeing it actually working. With this in mind, this tutorial will help you accomplish just that. On the other hand, if you just want the source code to the tutorial then you can download it here. By the way, if you haven’t already done so then http://www.madewithmarmalade.com/download and grab a copy of the free trial version of the Marmalade SDK and install it. We will begin with a few Marmalade basics so you don’t get lost during the tutorial. To begin with, Marmalade uses the concept of project files to organise your source files, data files and deployment settings. The MKB file is basically a text file that when opened up will generate a Visual Studio or XCode project containing your source files etc. files – This section tells Marmalade which editable files you would like including in your generated project, such as source files, XML files, configuration files etc..
deployments – This section allows you to define certain parameters on a per target platform basis. We won’t be covering this section in this tutorial but its worth mentioning. Marmalade will generate a data folder containing two .icf files and a build folder, you do not need to be concerned with these for the time being. You should not add additional source files via XCode or Visual Studio. instead, edit the MKB file, add your source files then re-launch the MKB file regenerate the project. 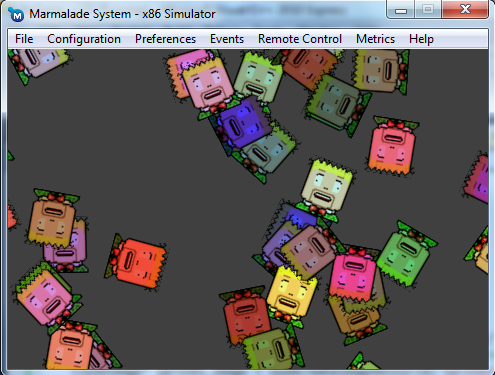 Now we are finally have the basics of creating a Marmalade SDK project out of the way, we now need something to compile and run. In this section we will cover creating a very basic game loop that checks for the user quitting and clears the screen. If you build and run this example you will be presented with a grey screen. yes I know its a bit boring, but we will cover drawing sprites and other interesting topics very soon.